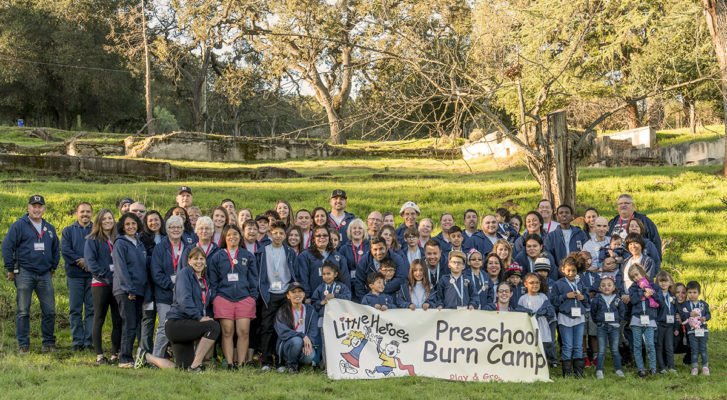 Little Heroes Preschool Burn Camp is a burn recovery program designed for preschool burn survivors, ages three to six years old and their families. This unique, three-day program helps families understand and cope with physical and emotional challenges associated with burn recovery. In a supportive camp environment, families have the opportunity to meet other families who are overcoming similar challenges. Three parallel programs make up a unique camp where families are able to play, laugh, and learn. The Preschool Program focuses on healthy emotional and physical recovery through therapy play and socialization with other burn survivors. The Sibling Program provides therapeutic recreational activities for older children and a daycare for infants and toddlers. Siblings are recognized as important and unique supporters to their burn survivor brother or sister. The Adult Program assists parents and caregivers by providing the support and education necessary to nurture a child who has suffered a severe burn injury. On behalf of the partners in recovery hosting this unique preschool burn camp program, we invite you and your child to “Come Play & Grow Together!” For more information, please contact Kara Garrett at (916) 739-8525. The Firefighters Burn Institute would like to recognize The Taylor Family Foundation for hosting Little Heroes Preschool Burn Camp which is held at The Taylor Family Foundation at Camp Arroyo each year. The Taylor Family Foundation’s mission is to preserve the wellness and enhance the quality of life for children in Northern California with life-threatening and chronic illnesses, disabilities and youth at-risk through unique therapeutic experiences and support. For more information, please visit www.ttff.org.